The National Gallery of Jamaica is pleased to announce that our most recent exhibition Beyond Fashion has been extended until February 24th, 2019. This decision was a result of the exceptional reception we received from you, our patrons. Beyond Fashion takes a deeper look at the relationship between fashion and art and how they may be integrated to produce works that speak to a variety of concepts. In this exhibition there are a myriad of art forms, such as photography, quilting, installation and jewellery to name a few. Thank you greatly for the support we have received and, if you have not seen Beyond Fashion as yet, we highly encourage you to do so. The National Gallery of Jamaica is pleased to present the first of two Artist Talks for its current exhibition Beyond Fashion on Saturday, December 15 starting at 1:00 pm. Beyond Fashion seeks to explore the capacity for fashion themed or influenced art making to reflect and interrogate complex personal and societal histories. The exhibition also questions the supposed distinctions between art and craft. These concepts will be explored in the context of this exhibition during this session. The discussion will be moderated by the exhibition’s lead curator O’Neil Lawrence and the panelist will include exhibiting artists Phillip Thomas, Yasmin Spiro as well as researcher, indigo dyer and artist Lucille Junkere. The panel discussion is free and open to the public. Persons in attendance will also have an opportunity to view the Beyond Fashion exhibition which will close on January 15, 2019. 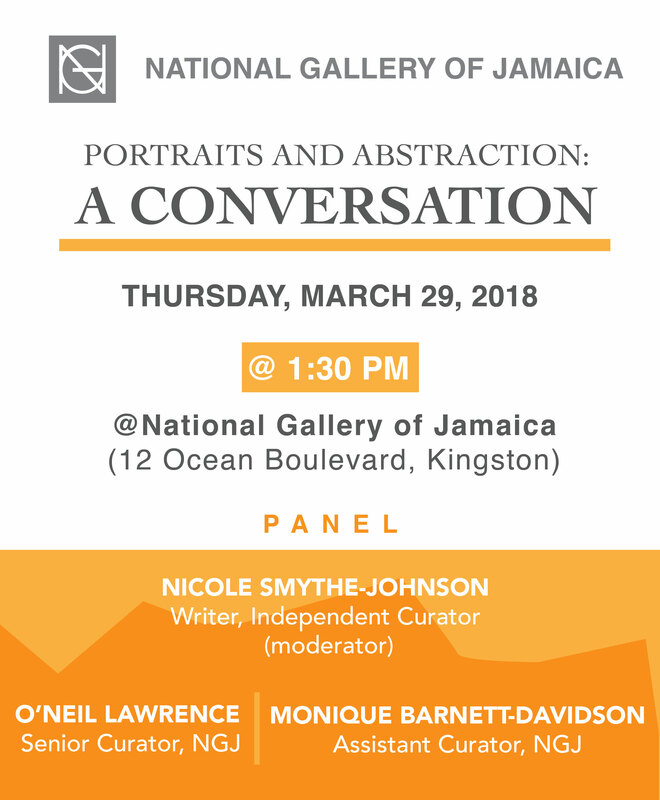 The National Gallery of Jamaica will be opening its newest exhibition Beyond Fashion for the September Last Sundays featuring guest speaker SiiM (Michelle Simone Clarke) and a theatrical performance by Quilt. Beyond Fashion examines the works of artists who have incorporated elements of fashion and it’s creation into their practice. It explores the capacity for fashion themed art making to delve into topics of the personal and the political, as well as providing a vehicle for experimentation and expression that goes beyond everyday fashion. Beyond Fashion includes the works of artists that have experience in fashion design, fashion photography and jewellery making. The exhibition includes the works of Marvin Bartley, Kereina Chang-Fatt, The Girl and The Magpie, Jessica Ogden, Ebony G. Patterson, Alfredo Piola, Ayana Rivière, Peter Dean Rickards, Jasmine Thomas-Girvan, Phillip Thomas, Yasmin Spiro, Seymour Lewis and Cosmo Whyte. Our Guest Speaker SiiM (Michelle Simone Clarke) is an architecture graduate from the University of Toronto who fell in love with fashion after her travels to East and Southeast Asia and Australia. After returning to Jamaica her line became known locally and regionally through her Butterflies & Hummingbirds collection, inspired by the lightness, colour and freedom of the tropical animals. SiiM currently consults as a Creative Director and her team has worked on events such as FASHIONBLOCK, International Reggae Day, Jamaica Carnival, America’s Next Top Model, The Wray and Nephew Contender and many others for over a decade. No strangers to the National Gallery of Jamaica, the Quilt Performing Arts Company was born out of a need for a fresh, new, innovative way of creating performance art. Using Caribbean rhythms, merging poetry, music and dance, the Quilt performers have developed their own unique performance style and an evolving theatre technique. Artistic director Rayon Mclean and his team continue break boundaries and redefine performance spaces. The group’s main focus is to provide pieces with a strong social message that forces audiences to think and reflect, feel, laugh, and learn. Doors will open to the public from 11:00 am to 4:00 pm. The formalities by will begin at 1:30 p.m. As is customary on Last Sundays, admission is free, but contributions to the Donations Box located in the Coffee Shop are appreciated. These donations help to fund exhibitions like Beyond Fashion and our Last Sundays programming. The National Gallery’s Gift Shop and Coffee Shop will also be open for business. 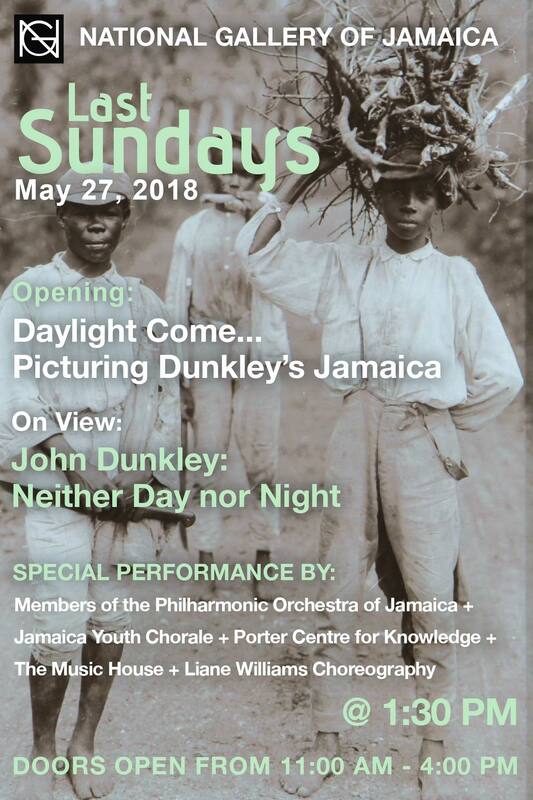 The National Gallery of Jamaica’s Last Sundays programme for the month of May will mark the opening of a new exhibition Daylight Come…Picturing Dunkley’s Jamaica. It will also feature a special ensemble musical performance as part of Lupus Awareness month activities. Daylight Come…Picturing Dunkley’s Jamaica complements the John Dunkley: Neither Day nor Night exhibition which opened on April 29.This retrospective of Dunkley’s work was curated by independent curator Diana Nawi, formerly of the Perez Art Museum Miami (PAMM), and Nicole Smythe-Johnson, independent Jamaican curator and writer. Originally shown at PAMM in 2017, this version includes six works that were not part of that initial exhibition. This new exhibition Daylight Come… explores themes such as tourism, immigration and the emergence of cultural nationalism in Jamaica during Dunkley’s lifetime. 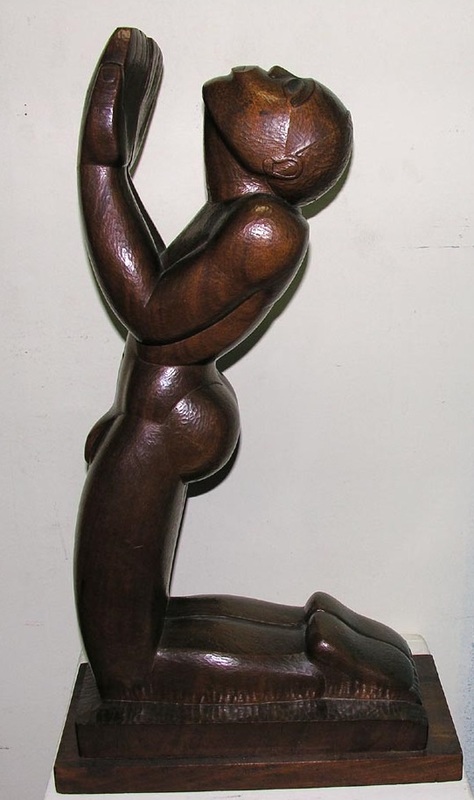 The exhibition provides further context to Dunkley’s creative output; exploring the works of his contemporaries David Miller Snr and David Miller Jnr, Carl Abrahams, Albert Huie, David Pottinger, Ralph Campbell and Henry Daley among others. This exhibition will be on view until July 29, 2018. May is Lupus Awareness Month and the special musical performance this Last Sundays serves as one of the activities to raise awareness to this life-altering disease. The music, poetry and dance that will be performed are all inspired by the emotional states experienced by someone with Lupus. The various performers include members of the Philharmonic Orchestra of Jamaica, the Jamaica Youth Chorale, the Porter Centre for Knowledge and The Music House. As is now customary for our Sunday programmes, the doors will be open to the public from 11 am to 4 pm and the special musical performance starts at 1:30 pm. Admission and guided tours will be free. The gift and coffee shop will also be open for business. 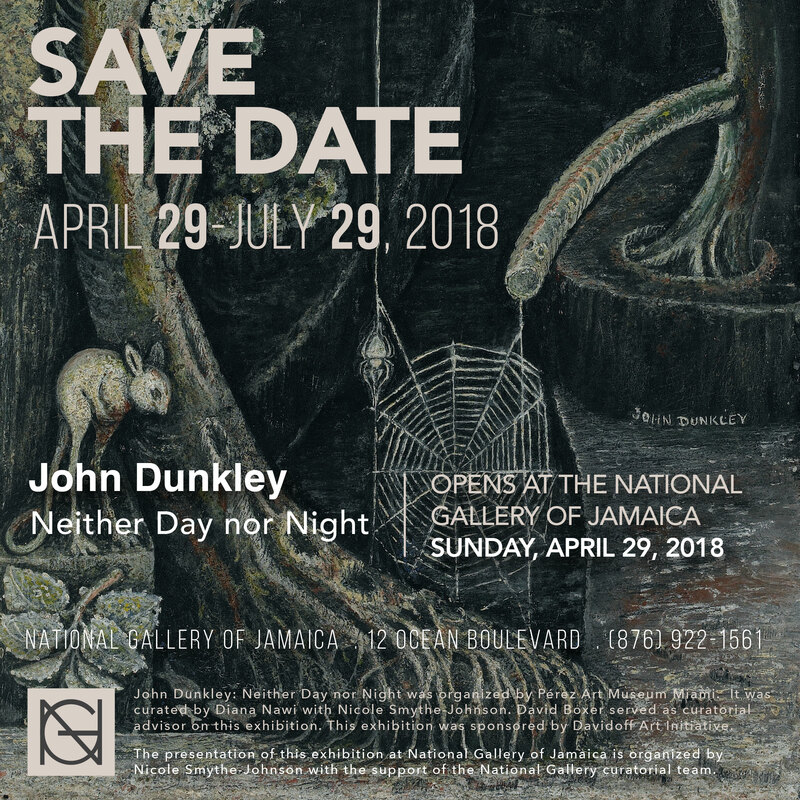 The National Gallery of Jamaica (NGJ) is pleased to announce the homecoming of the exhibition John Dunkley: Neither Day nor Night April 29-July 29, 2018 after its eight-month run at the Pérez Art Museum in Miami (PAMM) where it was hailed as one of “the most exciting museum shows around the US in 2017”. Little in the history of Western art prepares us for Dunkley, wrote the late Dr David Boxer (1946-2017), Dunkley historian and curatorial advisor to PAMM. “There is a hypnotic rhythmic intensity in Dunkley’s paintings that is alien to English and American masters,” John Dunkley (b. 1891, Savanna-la-Mar — d. 1947, Kingston) is considered one of Jamaica’s first and finest ‘Intuitive’ or self-taught artists and the title of the show is a reference to his work’s idiosyncratic mood and palette: detailed, haunting imageries of landscapes, with psychologically and psycho-sexually suggestive underpinnings. 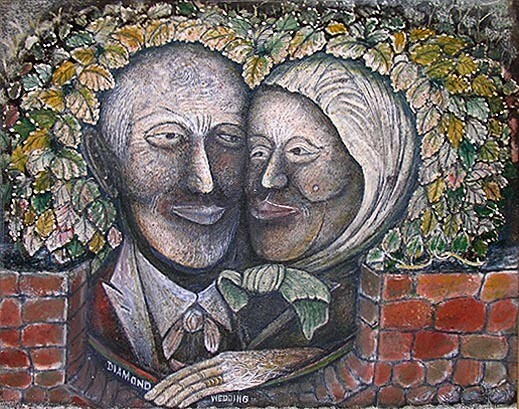 Though a selection of Dunkley’s work is on permanent display at the NGJ, only 50 paintings by Dunkley exist in the world. The exhibition’s return home then gives local audiences the rare opportunity to see this collection of thirty-four (34) paintings and nine (9) sculptures together for the first time since the NGJ Retrospective of his work in 1976. 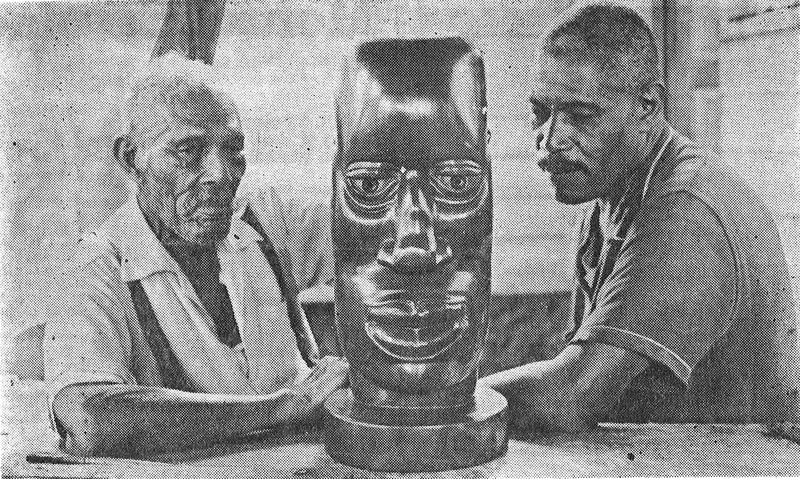 Aside from his inclusion in the 1939 World’s Fair in San Francisco and the NGJ/Smithsonian travelling exhibition of 1983, Dunkley’s work was relatively unknown in the United States until PAMM’s light shone on Dunkley as a beacon of modern and contemporary art from the Caribbean. The Miami exhibition, organized by Curators Diana Nawi, former Associate Curator at PAMM along with Nicole Smythe-Johnson, independent curator, received rave reviews from ArtForum, Miami Rail, The Huffington Post, among others and art critic Matthew Higgs lamented the fact that he would have included it in his Best of 2017 list had he seen it sooner. Smythe-Johnson, assisted by the NGJ Curatorial team, will oversee the local abridged installation of the show. An accompanying monograph will be published and includes: Dr David Boxer’s last essay, which brings together over forty years of research into Dunkley’s life and work; an essay by Olive Senior that contextualises Dunkley within his historical moment; and an essay by the exhibition’s curators.